Since 2004, leftover student loan debt has surged for every age group — from twenty-somethings just fresh out of school to sixty-somethings nearing retirement. In 2015, for example, consumers over the age of 60 owed more than eight times the amount of student loan debt than their age group carried a decade earlier. Meanwhile, Americans’ collective credit card debt just recently surpassed the $1 trillion mark, according to the Federal Reserve, while housing prices have ballooned. Consumers’ higher debt loads are making it harder for them to set aside enough money to retire. According to a 2017 survey by Bankers Life Center for a Secure Retirement, just 34 percent of middle-income Baby Boomers between the ages of 52 and 70 expect to retire without any lingering debt eating into their available funds. If you owe several thousand dollars in non-mortgage-related debt, you need to act now to shed your debt so you can put that money toward other priorities. What do those priorities look like? 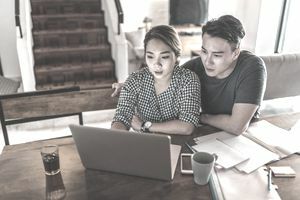 Financial planners typically recommend that you save at least 10 to 15 percent of your income every year for retirement, and one increasingly popular rule of thumb suggests 20 percent. You should also set aside money for emergency savings — at least three to six months of living expenses — so you don’t have to resort to credit cards to make up a sudden shortfall. If you owe so much money that you can’t afford to hit these basic savings goals, then your borrowing is too high. The financial services company Fidelity Investments recommends hitting certain savings benchmarks by each decade. The company says that you should have saved at least one times your salary by the time you turn 30, three times your salary by the time you turn 40, six times your salary by the time you turn 50, eight times your salary by the time you turn 60, and 10 times your salary by the time you turn 67. As you reach these milestone ages, deduct your non-mortgage debts from your total savings. If your debts are keeping your net worth below where it needs to be, then you’ve got too much — and the interest payments you’ve got on the horizon may push you even further from the path. To figure out what such an aggressive savings schedule would mean for how much you could afford to borrow, take a calculator and subtract the amount you hope to save each year from your annual income. Then use your monthly budget to assess how much money you would have leftover to spend on loan payments. For example, assume you’re currently in your 30s, making $50,000 and spending roughly 30 percent of your income on housing. After putting away $13,000 a year in your retirement fund, you would then have just $22,000 a year — or roughly $1,833 a month — left over to pay for other debts, such as student loans and credit card debt, as well as all your other monthly expenses, such as food, childcare, utilities, and entertainment. Considering the high cost of food, gas and car expenses, childcare, and other routine costs of living, that’s not a lot of money left over to spend on loan payments. Even annual boosts in income won’t make it much easier to carry excess debt. For example, if you were 50 years old, making $70,000 and still spending 30 percent of your income on a mortgage payment, you would then have just $2,250 a month leftover after setting aside money for retirement to spend on loan payments and other necessary expenses. If your loan payments are keeping you from aggressively saving for your future, then you almost certainly have too much debt. The closer you are to retirement, the more aggressively you should try to whittle down your loan payments. The last thing you want is for leftover debt to crimp your retirement and force you to take on more loans just to make ends meet.